The team behind RVLVR, Nick Bicanic and Ricky Berrin, are shooting an arrow into the heart of 360° content. The thought leaders at the forefront of the frameless media revolution (VR/AR/MR) are tackling narrative-driven fiction in 360° — and doing it well. The bicoastal company with offices in NYC and LA offers strategy/consulting, content production, and custom software solutions for clients like Mountain Dew, Toyota, Huffington Post/RYOT, NBC, and Comcast. 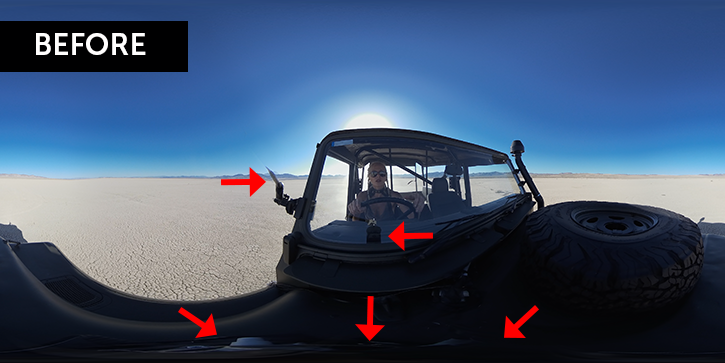 While many of today’s 360 video projects focus on journalistic angles like news, sports, or event coverage, Bicanic believes the largely untapped genre of fictional cinematic 360 has limitless potential, especially as more and more 360 content is consumed on mobile devices. Just like we love escaping to the movies or watching TV series, 360 content can provide that same story-driven connection to viewers. “Our primary focus is in figuring out how storytelling works in this space,” says Bicanic, a documentary filmmaker, mobile UX specialist, and serial entrepreneur. “Since UX is disproportionately more important when you move beyond the screen — a deep appreciation of it is vital for understanding how to move the medium forward both for ourselves and our clients.” This in itself, the reality of creating compelling 360 narratives, presents new, never-before-seen challenges to 360 filmmakers. RVLVR also turned to Mocha VR for its Lens Workflow module alongside After Effects paint and the clone brush to help roto paint a car shot. As for the future of 360 narrative, RVLVR is currently working on two other scripted 360 video series, and a narrative VR short for a major broadcast TV network.